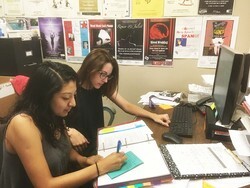 SFA theatre students Yanelly Vargas, left, and Kylie Wakulat review their rehearsal notes as they prepare for the opening of the SummerStage Festival, which runs June 29 through July 19. Vargas is stage manager for "Crimes of the Heart," and Wakulat is stage manager for "Pinkalicious the Musical." NACOGDOCHES, Texas - While many of their peers are taking summer vacations or lighter summer class loads, SFA theatre students Yanelly Vargas and Kylie Wakulat are deep in production mode for this year's SummerStage Festival at Stephen F. Austin State University. As stage managers for the School of Theatre's two featured plays - Vargas for "Crimes of the Heart" and Wakulat for "Pinkalicious the Musical" - the theatre majors have been busy for months, beginning with auditions in March, followed by design meetings throughout the spring and now rehearsals, all leading up to the SummerStage Festival opening on June 29. It's a tough, tricky job to make sure that the entire production team is on the same page. "Stage managers communicate with actors, directors and designers throughout the entire process," Vargas explained. "We run the audition process, and during rehearsals we assist the actors and director. We also create a prompt book that includes a script with blocking and light/sound cues. The prompt book includes any information needed for the production, such as cast list, calendars and reports." "We work closely with the director and the technical designers of the production to ensure that the vision of the director is met," Wakulat said. "When the shows begin their runs, the stage manager is the one to make sure that, with every performance, it is what the director intended it to be." "Pinkalicious the Musical" with book by Elizabeth Kann and Victoria Kann, music by John Gregor, and lyrics by John Gregor, Elizabeth Kann and Victoria Kann, is the story of Pinkalicious, a little girl who can't stop eating pink cupcakes despite warnings from her parents. Her pink indulgence lands her at the doctor's office with Pinkititis, an affliction that turns her pink from head to toe - a dream come true for this pink loving enthusiast. But when her hue goes too far, only Pinkalicious can figure out a way to get out of this predicament. "Crimes of the Heart" by Beth Henley is about three sisters with very different personalities and lives who reunite when the youngest of them, Babe, has just shot her husband. The oldest sister, Lenny, takes care of their grandfather and is turning into an old maid, while Meg, who tries to make it in Hollywood as a singer/actress, has had a wild life filled with many men. Their reunion causes much joy, but also many tensions, according to the description at imdb.com. "Crimes of the Heart" is the second show Vargas has stage managed at SFA. This past spring, she was stage manager for Denise O'Neil's "Sorry, Not Sorry," which was part of the School of Theatre's Festival of New American Plays. "Throughout this process, I have discovered that one of the most important things is communication," said Vargas, a sophomore from Carollton. "If any problems arise, I have to communicate with the appropriate people and find the most efficient solution. Communication is everything." During the past spring semester, Wakulat, who is a technical theatre and design major from Katy, stage managed "And the Pursuit of Happiness, 1994," which was also part of the biennial Festival of New American Plays. Last fall, she was assistant stage manager for "Mr. Burns - A Post Electric Play." She also stage managed throughout high school, including for productions of "Little Shop of Horrors," "The Giver," "She Kills Monsters" and "The People." Directed by Cleo House Jr., director of the School of Theatre, "Pinkalicious the Musical" will be presented in Turner Auditorium at 10 a.m. June 29, July 10 and 19; at 2 p.m. July 7, 10 and 18; and at 6:30 p.m. June 30 and July 14. General admission tickets are $8. A pay-what-you-can performance is at 2 p.m. July 10. "Crimes of the Heart" is directed by Dr. Inga Meier, assistant professor of theatre, and will be presented in the Downstage Theatre at 7:30 p.m. July 5, 7, 12, 13, 17, 18 and 19 and at 2 p.m. July 14. General admission tickets are $15 for adults, $10 for seniors and $5 for students/youth. An audience "talkback" session is planned following the July 7 performance. A pay-what-you-can performance is at 2 p.m. July 14. While stage managing is a difficult job, it's also a rewarding one that's filled with important lessons that will carry over into successful careers in professional theatre. "I wanted to work in SummerStage as soon as I could because I knew this would be a great opportunity for me to meet other students, faculty and staff members that I probably wouldn't be able to meet if it wasn't for SummerStage," Vargas said." As soon as I found out that Dr. Meier would be directing one of the shows, I knew that I wanted to work with her. Who knows if I would ever get the chance to work with her again, and I definitely didn't want to miss this opportunity." The SummerStage Festival is sponsored in part by Tipton Ford Lincoln. For tickets or more information, visit http://www.finearts.sfasu.edu/ or call (936) 468-6407 or (888) 240-ARTS.